Today’s post is a set of pillow covers I made for two brown pillows that used to live on our old futon, but clash rather hideously with the black couch we have now – meaning that they have been hiding out in a closet for a while. When I was shopping for fabric for my apron, I found some super cute Paris-themed fabric, and had to buy it. (I have studied French since 7th grade and finally had the opportunity to go to Paris last December, so this is definitely in character for me.) I wasn’t sure I wanted to use it for clothing, but realized this would be the perfect way to dress up the couch and breathe new life into the forgotten pillows. To make the pillow covers, I used the instructions for project 5 in Sewing Machine Basics, by Jane Bolsover. This is an incredible book packed with great information on all kinds of machine sewing techniques. I’ll definitely have to write a whole post about it and its companion, Sewing School Basics, once I’ve had a chance to try a few more projects from them. So far I can enthusiastically recommend them! The supplies I used for this project included about 2 yd of main fabric, 1 yd of contrast fabric, 6 yd of cotton piping cord, two 14″ zippers, and matching thread. I used the general purpose foot, the overcasting foot, and the zipper foot on my sewing machine. The first step was to measure the pillows to identify how much fabric was necessary. I found that my pillows were 16″ per edge (square), but I actually needed 18″ of fabric (plus 5/8″ seam allowances) to account for the pillow thickness. I made pattern pieces out of old tissue paper, ending up with a 19-1/4″ x 19-1/4″ square for the front and a 19-1/4″ x 10-1/4″ rectangle to make two back pieces connected by a zipper. With these lovely homemade patterns I cut out enough fabric for both pillows. I installed the zippers into the back pieces using the centered zipper method. I machine basted the two back pieces together to make a seam along the center back, then pressed the seams open. I neatened the raw edges of this seam using my overcasting foot and a zigzag stitch. With the overcasting foot, you place the raw edge right up against the little guide of the foot so that the zigzag stitch captures the edge. This is a technique that I learned from Sewing Machine Basics, and I’m a little sad I didn’t know about it when I was making earlier projects. It prevents the raw edges from fraying and adds a professional touch. It definitely adds time to a project, but in my opinion it is so worth it. Next I basted the zipper into place by hand so that it was equidistant from the edges and so that it would open right in line with the seam I had just basted. I used my zipper foot to secure the zipper all the way around. To finish the zipper, I removed the (green) basting stitches from the zipper, then carefully removed the basting stitches that made the central seam. The back pieces were ready to go with working zippers. Now it was time to make the red piping, which was the most time-consuming part of this project. The basic idea of making piping is encasing cotton piping cord in the fabric of your choice. I used 3/8″ piping cord for the pillow covers, which I believe is the same as size #5. The fabric strips used for the piping were cut on the bias (like bias tape), which means at 45 degrees to the main selvage of the fabric. Based on the piping cord diameter and desired seam allowances of 5/8″, each strip was 2.5″ wide. I found it helpful to draw the lines using chalk pencil before cutting – otherwise I’m sure it would have been impossible to stay at 45 degrees. To make one long, continuous strip, I sewed strips end to end along the diagonal ends with 3/8″ seams. Then I pressed the seams and trimmed the corners that extended over the edges. This step took a little trial and error to get the alignment correct, but turned out pretty well. To assemble the piping, I placed the piping cord inside the long bias strip with the right side out and used the zipper foot to sew as close as possible to the piping cord. This part was really tedious because I had to keep stopping to adjust the cord and make sure the raw edges were staying aligned. Does anyone have any tips to make this easier? I ended up with about 12 ft of piping in this lovely red accent color, ready to attach to the pillow covers. I temporarily attached the piping to the right side of the front piece by lining up all the raw edges and basting the piping into place. To help the piping turn the corners, I cut out notches in the seam allowances at each corner. I made sure the place where the piping joined was at the bottom. To finish assembling the pillow cover, I put the back piece on top of the front piece + piping with right sides facing (making sure to open the zipper first! ), basted all the pieces together, and seamed all the way around as close as possible to the piping. Then I painstakingly removed all the basting and neatened the edges all together with the overcasting foot. To make the seams less bulky at the corners, I trimmed each corner at 45 degrees right next to the seams and neatened those edges too. Then I turned the pillow covers right side out and marveled at how well they turned out! Finally, I stuffed the old brown pillows into the new covers and dressed up my couch with my awesome new pillows. In total, it took me about nine hours to make these pillow covers, and about half of that was making the piping. I definitely think the piping was worth doing though; it adds a nice contrast and makes the result look much more professional. I’m excited to have a slightly classier looking couch, pleased that I breathed new life into pillows that weren’t being used for anything, and enjoying the daily reminder of the wonderful memories of my trip to Paris. This project is a simple tote bag with two different fabrics on the outside and a single-fabric lining. It only took a couple hours and I’m sure would be faster if I made another one. I chose bright, summery fabrics for this project: yellow, blue, and white flowers on a navy blue background for the main color, and yellow with subtle little white leaves for the contrast color and the lining. I originally planned to make the straps out of cotton webbing as the pattern called for, but soon decided that the tote bag would look more integrated and well-designed if I sewed the straps from the main flowered fabric. The process was similar to making the straps for the apron, with the addition of topstitching accents. After cutting two strips of fabric that were 4″ wide and 44″ long, I sewed each strip together with right sides facing and 1/2″ seam allowances, then pressed the seams open. Next, I put a safety pin on the end of each tube and used a wooden dowel to turn the tubes right side out. I pressed the straps flat with the seam along one edge (rather than in the center as it is in the picture above). To finish the straps, I topstitched about 3/16″ from each edge with a contrasting yellow thread. The finished width of the straps was 1.5″ and at this point they were extra long. Now that the straps were complete, it was time to assemble the bag. To make the outer panels, I simply sewed one straight seam per side to attach the smaller yellow pieces to the flowered pieces, then pressed the seams open. It wasn’t clear to me yet why the pattern included the notches at the bottom. Next I attached the straps to the lining and the outer panel of each half of the bag by sewing across the top and sides with right sides facing and the strap sandwiched between the two layers. I didn’t keep the straps as long as they started, but adjusted the length so the bag would hang comfortably, then simply cut off the excess length after sewing. Finally, I learned why the notches were there: they were designed to make the bottom of the bag sit flat. To achieve this, I had to simply line up the two cut edges of each notch and sew straight across on the lining side. After a quick line of topstitching around the top edge for strength, the tote bag was complete and ready to carry all my knitting projects! My goal for May was to knit up at least 300 g of yarn. I ended up only using 220 g, but 35 g of that was lace yarn, so I actually made quite a lot of stitches! I completed four distinct projects this month – no multiples of one item this time. First, I made one more Plait Headband using 30 g of pink Malabrigo worsted merino. This was the wide version, which is designed to cover the ears for cold weather. I made it a little shorter than the other wide headbands I made last month, simply because I ran out of yarn. The next project used up another colorway of Malabrigo worsted, dark blue. I made a Foliage Hat by Emilee Mooney, of which I had made a couple a few years ago and really enjoyed. This one turned out quite a bit bigger than the other two. I’m not sure what happened, since I used the same yarn and needles – maybe my knitting has gotten looser? Anyway, it’s still a reasonable size for my head and would also fit someone with a larger head. Project #3 used yet more worsted Malabrigo, this time the Rios line in a purple and green multi colorway. A cowl is a great way to use up a whole skein of Malabrigo, and for this project I chose the Very Braidy Cowl by Maryse Roudier. It was a pretty quick knit with cool 16-stitch cables. A slight word of caution: I misread the pattern while I was working the first few repeats, putting a few too many rows between the cable rows. pattern said to “repeat rows 5-24“, which I misread as “repeat rows 1-24“. I think the pattern would be more clear if it just said to repeat rows 1-20 instead. Anyway, it didn’t make too much difference to the final product. Finally, I spent most of the month working on the Good Day Sunshine Shawlette by Amanda Bjørge, using 35 g of red Lorna’s Laces Helen’s Lace (also used for my wedding shawl). This was a fun project because I learned some Estonian gathered stitches, including “3 into 3”, which means k3tog, keep stitches on L needle, yo, k3tog the same 3 stitches again. These kind of stitches make a thick, cozy fabric, which is a nice change of pace in a lace piece. I also tried cable stitches without a cable needle, and it worked really well on the little 2-stitch cables for this pattern. I’m eager to try it on larger cables. Unfortunately, the shawl ended up way smaller than I expected and did not use up all the remaining yarn…turns out it’s important to check your gauge! I used the recommended needle and I guess my knitting is tighter than the designer’s. I’m still happy with the result, as it’s a small size that just adds a bit of color without getting in the way. Is it just me, or does the combination of the shape and color remind you of a phoenix? For my second project with my new sewing machine, I made myself some flannel pajama pants using Simplicity pattern 2819. I found cute flannel fabric with a bird motif – I’m really into birds lately! – and got to work with the help of my sewing class instructor. The layout of the pajama pants was straightforward, consisting of two front pieces and two back pieces. Immediately after cutting the back pieces, I realized that I had placed the pattern upside down, so the birds on the front would be facing the right way, but the birds on the back would be upside down. And I definitely didn’t have enough fabric left to cut the back pieces again. Oops. Undeterred, I forged ahead with the project, figuring that no one would really notice the back of these pants anyway. I mean, these are for sleeping and lounging around the house! The first bit of sewing was to create the outer leg seams, sewing the left front to the left back and the right front to the right back. Then on each leg I made the bottom hem by folding the edge up about 1″ and pressing, folding the edge up 1″ again and pressing, and sewing a straight seam close to the fold. I think that’s the first hem I’ve turned! I made a preliminary 1″ hem on the other edge for the waist, only folding it up once this time since there would be more finishing later. Then I sewed both inner leg seams to create tubes. They were starting to look like legs, but not quite pants just yet. Next came the fun part – finally connecting the two legs! I kept one leg inside out and turned the other one right side out, then stuffed one inside the other so the right sides were together. Once the center edges were aligned, all it took was one simple seam from front to back to join the two legs. The last step was to finish the waistband. I folded over the waist edge by about 1 1/4″, enough to hold 1″ wide elastic with a bit of room, then sewed close to the edge around the waist, leaving a 2″ opening to insert the elastic. I measured enough elastic to fit around my waist snugly, then threaded it into the waistband casing. I double-checked the fit and securely stitched the ends of the elastic together. Finally, I sewed across the 2″ opening to close the waistband, and the pants were ready to wear! This was a very simple pattern to work with, and I would definitely make these pants again. Next time I think I’ll go for lightweight cotton for summer, and of course I’ll pay closer attention to the orientation of the pattern pieces before cutting my fabric. A couple minor things I might try are making the legs just a bit longer and adding a drawstring. During April, I made the most progress of any month so far in this challenge. Not coincidentally, this was also the month that I defended my Ph.D. dissertation – I was doing a lot of knitting to relieve stress! I completed several items, although as you’ll see, most of them were small. That’s kind of what you get when trying to knit through your stash – it’s time to get creative and figure out how to use up small quantities of yarn that aren’t enough for a whole hat/scarf/blanket/etc. The total quantity of yarn I used this month was 360 g, or 7.2% of the original amount. My first completed item this month was the orange baby blanket I’ve been making steady progress on all year. I made a big push on this blanket during the first couple weeks of April, using up 220 g of yarn. I purchased the orange yarn (along with some reddish pink yarn) three years ago intending to use it for cute table decorations for my wedding…but then I realized that it’s crazy to try to make yarn-based centerpieces mere weeks before your wedding, with so many other details to manage! I already made another heart baby blanket with the other yarn, so I’m thinking it will be fun to use the two blankets for my future children, to remind us of how much fun we had at our wedding. Overall, I’m happy with my progress this month. If I can maintain this pace for the rest of the year, I’ll be in really good shape for completing the stash challenge in a reasonable amount of time. Back to knitting! I’m excited to announce that one of my photographs is part of an upcoming exhibit! My instructor from the Beginning Photography class organizes this show every year for her students to display their work. 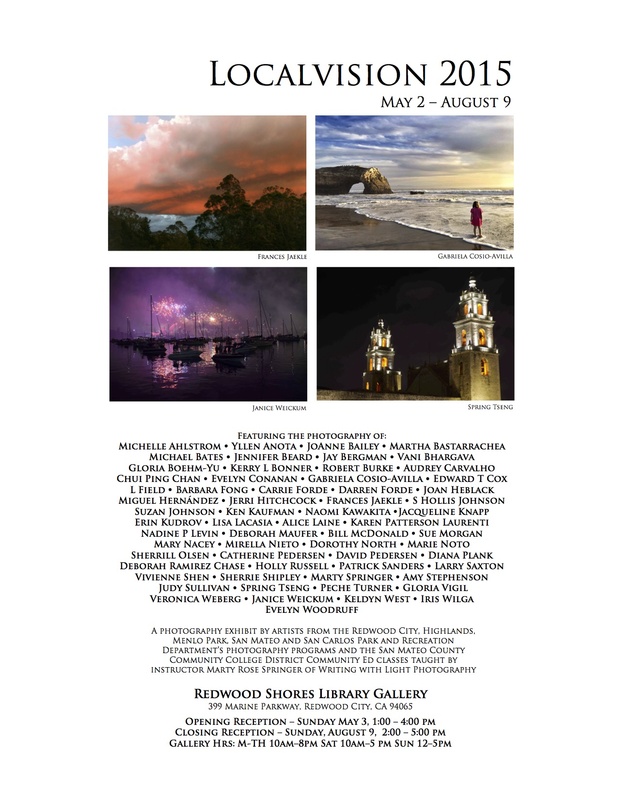 If you’re in the Bay Area and like photography, please consider stopping by! The exhibit opens this weekend and runs through early August (details below). For our anniversary last year, my husband bought me a beautiful new sewing machine (Singer Quantum Stylist 9960). I was so excited to start whipping up all kinds of clothes on the new machine, except then I realized that I didn’t really know how to sew. I mean, I can fix a hem and hand sew buttons, but the last time I made anything more complicated than that was a little letter Z pillow I sewed in 7th grade. (Letter Z – because I like to sleep…Zzzz…) So anyway, I’m basically a beginner. Fortunately, there was a beginning sewing class offered through the local recreation department during the month of March. I jumped on the opportunity to have someone walk me through a simple sewing project, and this class did not disappoint. Over the course of four sessions, we learned how to read a pattern, lay out and pin the pattern, cut out the pattern pieces, sew plain seams with proper seam allowance, turn narrow strips, design custom-sized pockets, and basic topstitching, all while creating a reversible apron. The pattern we used in the class is the Simplicity 2691 apron pattern. The apron has a fixed-length neck strap, long waist ties, and one pocket on each side. The pockets and apron front have contrasting top bands. The first step was to lay out and pin the pattern pieces to the fabric. I selected three cotton fabrics for the apron: green, yellow, and a green/yellow/white/blue multi pattern. This part took a really long time because I found it difficult to make sure the fabric stayed flat and smooth while I pinned the pattern to it. Also I’m a bit of a perfectionist, so that may have had something to do with it. Next I cut out all the pieces. I chose to make the main body of the apron in the multi pattern fabric on one side and the green fabric on the other, with yellow contrast on both sides. This part is pretty fun, because the feeling of cutting fabric with a really nice pair of fabric scissors is just satisfying. (Is that just me?) As a side note, I bought my scissors several years ago at Jo-Ann Fabrics with a 50% off coupon, so I splurged on a really nice pair, and it was totally worth it. The first pieces I sewed were the neck strap and waist ties, which I made of the contrasting yellow fabric. These were pretty simple: fold in half and sew around one end and the long edge, then turn inside out using a long dowel. After the ties came the pockets. This was the one place where my teacher encouraged us to ditch the pattern and try making our own pockets. I opted for medium rectangular pockets, where the pattern had smaller pockets with rounded corners (which I assumed would be harder to sew). My pockets were designed to be double-thick, so I simply cut a rectangle of fabric that was the desired width and about twice the desired length. To sew each pocket, I first attached the pocket band by pinning the right sides together and simply sewing straight across the edge. Then I pressed the seam I just created toward the top of the pocket. I folded the long rectangular pocket piece in half with the right side in, then sewed around the two sides (the bottom was just a fold). Finally, I folded in and pressed the top edges (both front and back) and sewed a topstitch across. The pockets were now double-layered closed rectangles. I’m pretty happy with the way it turned out, especially for being the hardest sewing project I’ve done to date (sorry, Z pillow!) I was a little disappointed with how large the apron turned out, since I followed the size guide on the pattern in choosing which size to make. But it works just fine with the waist straps wrapped around in front like in the pictures. Also, my topstitching could use some serious work. The spacing from the edge is inconsistent and sometimes pretty wavy. Things to work on in my next project! Overall, I am proud that I made a cute, functional apron. Although I haven’t been very good about posting this month, I have made some significant progress on my stash challenge! I’m deep in the serious part of writing my dissertation, so it’s been wonderful to spend time knitting in the evenings to relax and rest my mind. This month I completed three projects and put a dent in a fourth larger project. I used up 300 g of yarn on these projects, or 6% of the starting total (5000 g) – not too bad for one month! Now I’m on a pace to finish my stash challenge in about a year and a half, which is far more respectable than last month. So, what did I make in March? First, I made a multicolored farmer’s market bag from the Hexagonal Market Bag pattern. I used Lily Sugar’n Cream yarn, a nice multipurpose cotton yarn. The bag took 60 g of yellow and 90 g of blue/yellow/white. I modified the pattern ever so slightly in the last step: instead of using a three-needle bind-off to join the strap to the rim of the bag, I used grafting for ribbing. This technique is pretty similar to standard grafting with kitchener stitch, but instead of working all the stitches in order, you separate the knit and purl stitches onto two needles, work all the knit stitches, turn, and work all the remaining stitches, which now look like knit stitches. I really prefer the look of the grafted join, since it looks identical to the opposite end of the strap. The bag became a gift for my mom. Next, I got to work on using up some of the Malabrigo merino worsted I have left from numerous other projects. I made the Bloom Couture Headband by Melissa Monday with some green Malabrigo. It only took 15 g to make the whole headband, so I’m thinking this is a great way to use up little bits. Plus the awesome colorways that the Malabrigo comes in mean the headbands really add a pop of color! I also made some more progress on the heart baby blanket I showed last month. I used 115 g of Red Heart Classic Soft yarn in orange, finishing off my current ball. Right now the blanket is about 56% finished, so hopefully I’ll have it done by the end of next month. In progress and getting bigger! Finally, I decided I was tired of knitting other people’s designs and it was time to design my own headband. I came up with this plaited headband design, which I’ll write a full pattern post for in the near future (I’m still working out some of the details to make it clear and complete). This headband used 20 g of purple Malabrigo merino worsted. I’m really proud of the way it turned out, and I can’t wait to make more headbands and share the pattern with you all! Today’s post features two accessories I made for my husband. The first one is an example of my bad habit of taking a long time to finish a project. In this case, I did all the knitting for the mittens pretty quickly, but didn’t quite have time to purchase and sew on buttons before Christmas, so I gave them to him with the promise “you can pick the buttons!” That turned into months and months of waiting, until we bought two different types of buttons 11 months later. So then he got them for Christmas that year…not! Since there were two choices for the buttons, neither of us could decide which ones to use. It took another ENTIRE year until I finally sewed on the dang buttons, which took all of 20 minutes. So two years later, he actually got to wear his mittens in December 2014. That is epic procrastination, and I’m not proud of it. Fortunately, the hat was finished much more quickly. I started it in December 2014 and finished it just a couple weeks later in January. This is probably more a function of hats being easier for me to finish than other items, but I’m hopeful that I’m turning the corner on finishing what I start. The yarn I chose for these two items is Debbie Bliss Donegal Luxury Tweed Aran, a wool/angora blend, in a soft blue with bits of white and brown. One ball can easily make a hat, while it took about one and a half balls for the mittens. Both of the patterns come from the Interweave Knits Accessories 2011 magazine, which I’ve mentioned before. The Juris Mittens, by Alexis Winslow, combine fingerless gloves with a mitten flap in a classic tweed. They are constructed from the cuff up, knitting the fingerless gloves first. Then the mitten flap is made by picking up stitches along the back of the hand, then knitting in the round. The gauge is fairly tight to keep the hands nicely insulated. These mittens were my first project involving individual fingers, and I was pleased that it wasn’t much harder than making a thumb, it just took more time to make them all. I followed the pattern pretty much exactly, and I really liked the results. I took a bit more liberty with the Thoreau Hat, by Terri Kruse. This hat begins with twisted 1×1 ribbing, then moves into stockinette with a single detail panel consisting of ribbing and a 3-stitch mock cable. I liked the overall look of the hat, but as I soon as I started working the 3-stitch mock cable, I realized I would prefer to do a real cable. So I made one up – I had never seen a 3-stitch cable before. My method was the following: sl2 to cable needle and hold in front, K1, sl2 back to left needle from cable needle, sl1 to cable needle and hold in front, K1, K1 from cable needle. This basically resulted in knitting the 3 stitches in reverse order from left to right. Together, these two accessories are perfect to keep my husband warm throughout the winter. Although the hat wasn’t quite finished in time, he was able to wear the mittens during our trip to London and Paris in December. The combo gloves/mittens were just right to keep his hands warm while taking lots of photos of the cities! This wasn’t a very productive month of knitting. As I mentioned before, I have a minor hand injury which kept me from doing much knitting for a few weeks. But fortunately, it’s on the mend and I was able to knit some during the past week, so I actually have some progress to report! First, I whipped up a cabled baby hat using 10g of Bernat Softee Baby yarn on size 5 double pointed needles. The pattern consists of ten simple cables, with the cable crosses for adjacent cables worked on different rows. I have used the pattern several times, because it knits up quick and the cables are fun and easy. With this particular yarn, the hat ended up pretty small. This might be ok for a newborn, but I kind of doubt it would fit after even a couple weeks. Next time, I’d like to make a slightly bigger hat, either by using a different yarn or by modifying the pattern to include more cables and more length before the crown decrease. Next, I worked on a baby blanket that I started a while ago, using up 25g of Red Heart Soft yarn. This is the second time I have made one of these blankets, and they’re really cute. I modified the pattern to include several rows of garter stitch in between the heart panels. I like working on this pattern because there are enough differences between rows to keep my interest, but it’s not too challenging so it’s easy to watch TV in the background. And it’s a great way to use up several skeins of yarn – this one has taken 1.2 skeins so far, and will likely use at least 3 skeins in total. At this rate I will finish my stash in late 2017…here’s hoping I can pick up the pace!